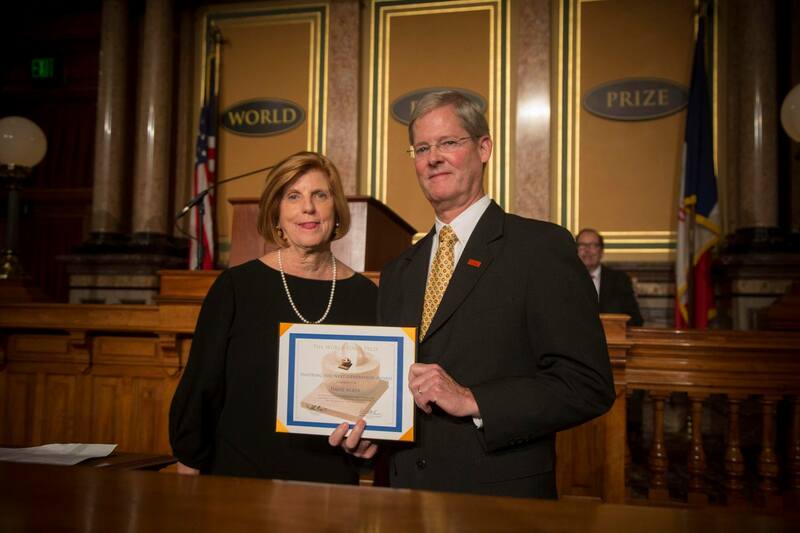 DES MOINES, Iowa – The World Food Prize presented the inaugural “Inspiring the Next Generation” award to Iowa State University Associate Dean David Acker. Presented during the Laureate Award Ceremony on Thursday night at the Iowa State Capitol, this award recognizes the tireless dedication Acker has shown in encouraging students, through the World Food Prize youth programs, to follow in the footsteps of Iowa hero Norman Borlaug. The award was created to honor those teachers who are critical to the success of the World Food Prize youth education programs. “Thousands of students are involved in our youth education programs thanks to the inspiration they receive from their teachers,” said Quinn during the announcement of the award. While the World Food Prize presents several awards and honors for the achievements of student participants, the “Inspiring the Next Generation” award is the first to acknowledge the hard work done by teachers. Acker, a professor of agricultural education at Iowa State University, has been involved with World Food Prize youth programs since its inception. For the past 20 years he has provided educational leadership through the Iowa Youth Institute, the Global Youth Institute and the Borlaug-Ruan International Internship. He has been a central figure of guidance, encouragement, instruction and inspiration from his extensive experiences in the field. “What makes the award especially meaningful is knowing that there are hundreds of students and teachers who are past participants in the World Food Prize Youth Programs who have committed themselves to STEM education and the grand challenge laid down by Norman Borlaug,” said Acker when he received the award. Jeanie Borlaug Laube, daughter of Norman Borlaug and a former teacher, presented the award. “My father always considered himself a teacher. I know he is deeply grateful for all that you have done to inspire the several thousand students who participate in our programs each year,” she said of Acker. Jeanie Borlaug Laube, daughter of Norman Borlaug and a former teacher, presented the award to David Acker, CALS associate dean for academic and global programs.